LAGOS APRIL 15TH (NEWSRANGERS)-One of the police officers who fatally shot at a couple on Saturday morning in Ajegunle, Lagos, “escaped” after the incident and has been declared wanted, the police have said. Bala Elkana, the Lagos police spokesperson, said five officers are now in custody following the incident. The deceased, identified as Ada Ifeanyi, 20, died from the gunshot injuries while her partner, Emmanuel Akomafuwa, 32, is still receiving treatment at an undisclosed hospital. “Members of the team suspected to be involved in the shooting are from Trinity Police Station and are currently facing internal disciplinary proceedings at the Command Headquarters Ikeja,” Mr Elkana said in a statement on Sunday. “Five police officers have been arrested. They are; Adamu Usman, Adeyeye Adeoye, Kashim Tijani, Lucky Akigbe and Paul Adeoye, all from Trinity Police Station. The police did not state the reason for the fatal shooting but added that the culprits have been detained. Mr Elkana, a deputy superintendent of police, said the suspects’ rifles have been retrieved for forensic analysis, and if found wanting, they would be charged with murder. Zubairu Muazu, the police commissioner, condemned the “senseless killings” of unarmed civilians in the state. “These killings are perpetrated by few ‘bad eggs ‘ in the Command who are bent on denting the image and reputation of the nation’s Police Force,” he said. Mr Muazu condoled with the family and friends of the deceased and promised to foot the medical bills of Mr Akomafuwa. 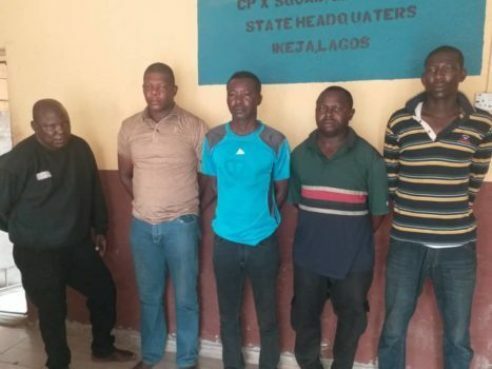 The police said it had dismissed four officers for abuse of power and misconduct – and they had been charged to court and remanded in custody -0 while various degrees of punishment had been awarded to 41 others. “The command will not relent in its efforts in ridding the force of these criminal elements,” Mr Muazu said.